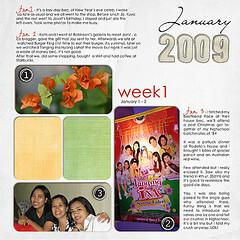 Here is my Project 365: Week 1 layout that I wanted to share, I have also made a layout for week 2-4 but I have not finished putting journals that is why I have not uploaded it. Yay my ambitious project, I am keeping my fingers crossed that I can finish it till end of December. Weee what a project that is.!! Sometimes when I am so inspired to scrap, I already forgot about the time. Been doing scraps everyday but this weekend I promise myself that I will treat myself at the mall. I will also have my broken 50mm lens fixed and I will also look for a nice tv stand for my room. I'm still working on my layouts for January too. I have the pictures but need to do the pages now!! I love yours, what a tremendous start!